When you've put in the miles, honed your training to perfection and marked off the race weekends in your calendar, you need a bike that's up to the task. That's where the CUBE AMS 100 C:68 SL 29 teamline comes in - designed to perform in the toughest of race conditions, so that you can realise your potential. Setting new standards for low weight and high stiffness, peerless components including Fox shocks and Shimano XTR gears and brakes mean you can concentrate on one thing: winning. We've been making fast, agile four bar full suspension frames for over 14 years, but the new CUBE AMS 100's goals of ultimate stiffness and lowest possible weight meant we had to right back to the drawing board. Our engineers used our best C:68 carbon and Twin Mold Technology to create a sleek, responsive and ultralight frame that sets new standards. Featuring Di2 compatibility, stiffness-enhancing Boost148 rear and tapered head tube plus a stealth approach to bolts and bearings, it's in a class of its own. An uncompromising frame demands an uncompromising approach to equipment. That's why we started with Shimano's standard-bearer, the XTR component group. With a wide-ranging 11-42 11-speed cassette and 36x26T chainset, it's the new benchmark for transmission reliability and slick, trouble-free performance. 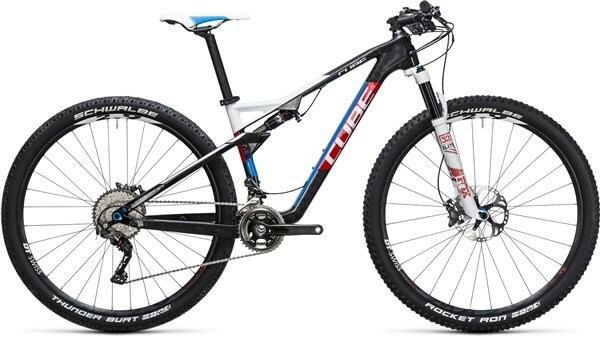 The brakes clamp to a 180mm rotor up front and 160mm at the rear for fade-free power on even the longest descents, while light and stiff CSW MA 2.9 wheels shod with Rocket Ron and Thunder Burt tyres transfer ever pedal stroke, steering input and brake impulse direct to the trail. 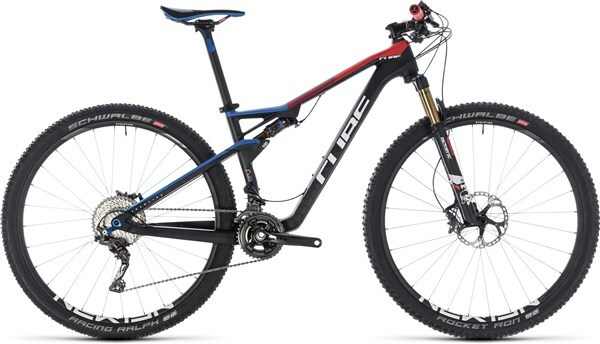 A Fox Float DPS Performace Elite Remote shock and matching Fox 32 Float Performance Elite SC fork tame even the toughest of trails, and the CUBE carbon handlebar shaves more vital grammes and adds a dose more comfort. Peerless? We like to think so.